If there’s one thing I can’t get enough of right now, it’s jewelry that makes a surprisingly bold statement. I have loved it for years and years and am just not sure I will ever change. What I love about unique pieces is that you can use them to dress up even the most casual of outfits, and it adds just the tiniest bit of mmmph to elevate any look. I love delicate minimal pieces too. With pieces that are so classic and understated, it perfectly combines elegance and that effortless cool-girl vibe. And anything with a bohemian vibe really speaks to me. I tend to dress in a very boho-glam style daily. It's just my thing. A girl can never really have too many accessories if you ask me! The Laurel Lariat Necklace stole my heart. This is a vintage gold mesh chain with layers of iridescent grey glass pearls and leather wrapped beads. Soft feminine touches meet chic and modern styling. You can wear it open or tie together as a lariat and I love that versatility in a piece. And I adore the length on this one so much at 55 1/2" . It looks perfect with that deep V triangle neckline that you ALWAYS see my wearing. 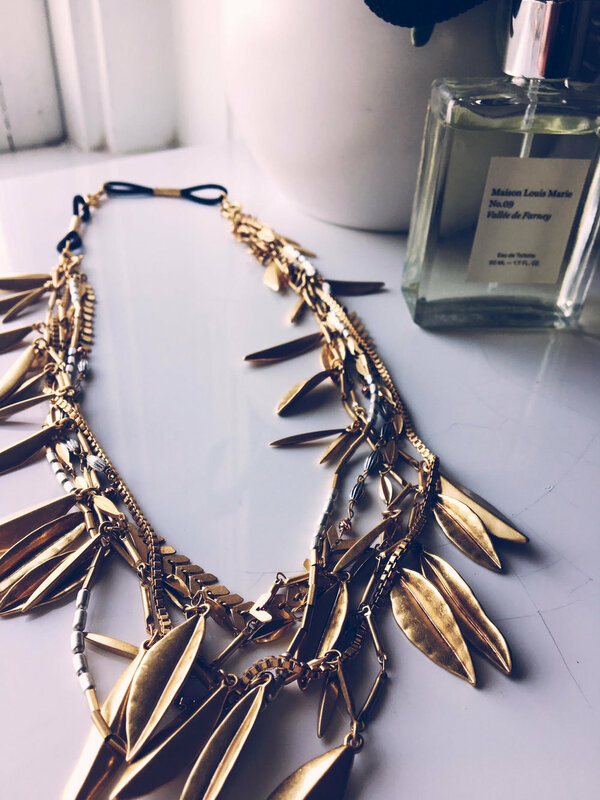 And the 2nd beauty that has now moved into my jewelry box is the Garland Fringe Necklace. This babe is bringing it hard because you can wear her 5 different ways! Talk about versatile and worth every penny. 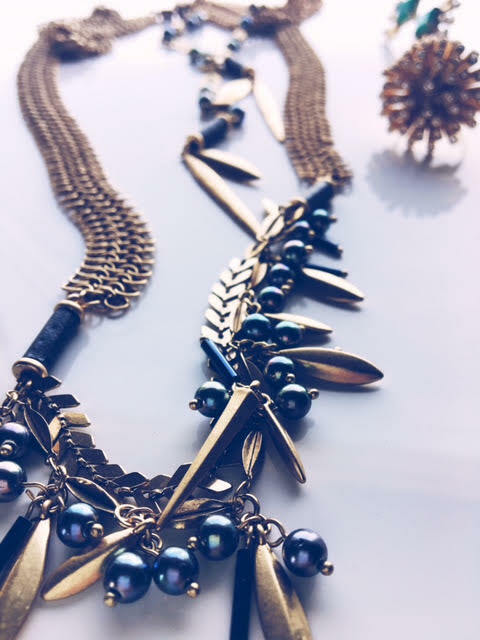 Gorgeous mixed metal beads and vintage gold leaves catch the light and move along with you. The leaf strand can be removed and worn as a headband by attaching the elastic extender which is included. Hello Austin City Limits and Coachella. I am having so much fun getting to know this one. I have tried multiple ways of styling this piece and it has looked so amaze with everything. These are both pieces that I am going to get long time wear out of. I am excited to carry them along to Spain. I am getting rid of so much as I am moving there with only two suitcases so these versatile pieces are going to be the perfect companions for me. Annnd I am a sucker for an oversized cocktail ring. 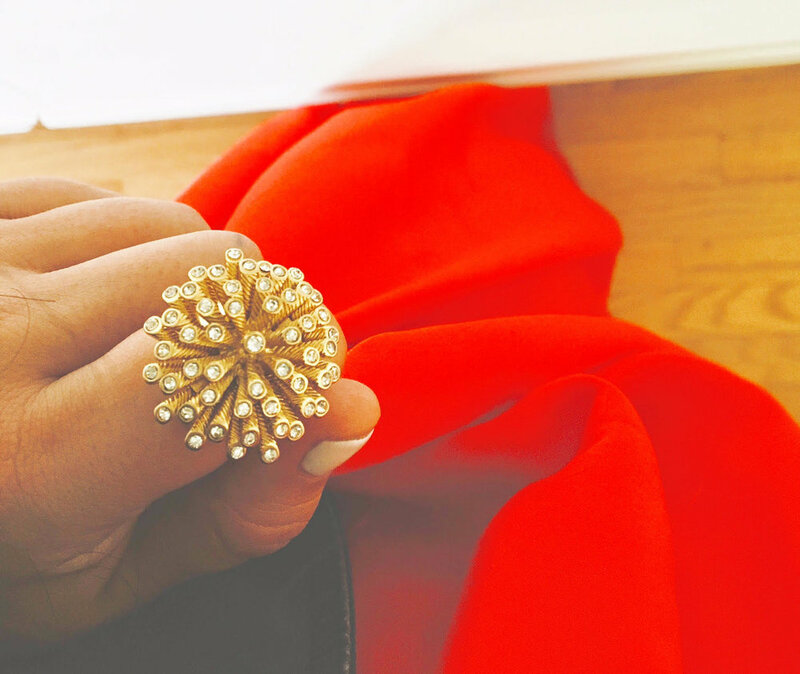 An eye-catching ring can be just the right accessory to add a little sparkle to your outfit. And with all your festivities, work events, and dinner soirees, why not add the perfect statement piece to elevate your look?! 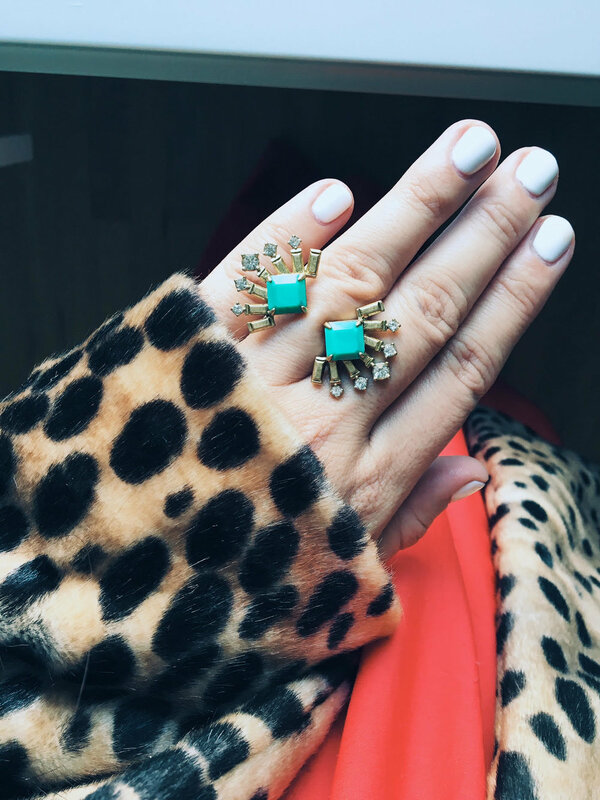 For me there is nothing like a super Texas-Sized ring to make the simplest outfit feel stunning. They are just my favorite things ever. 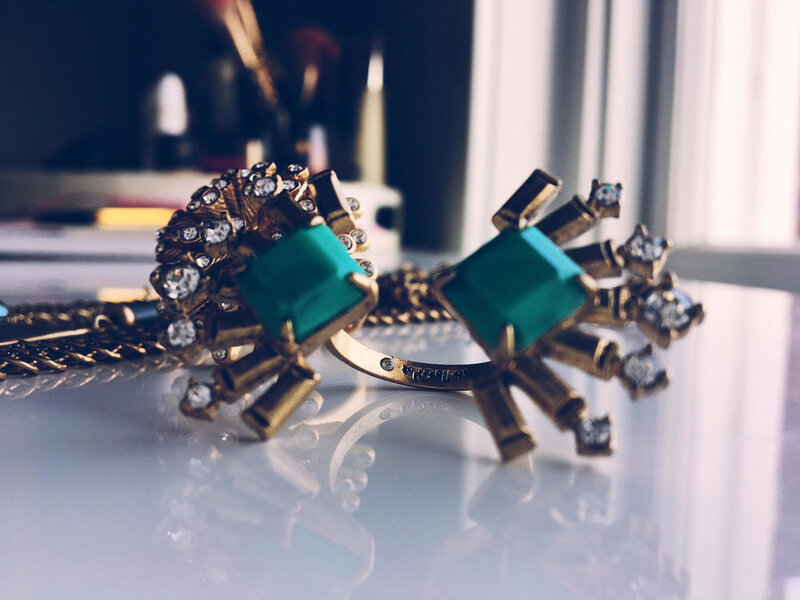 I fell head over heels with three rings from Stella & Dot and just wait until you see these. OMG! And the prices are going to have you saying OMFG. 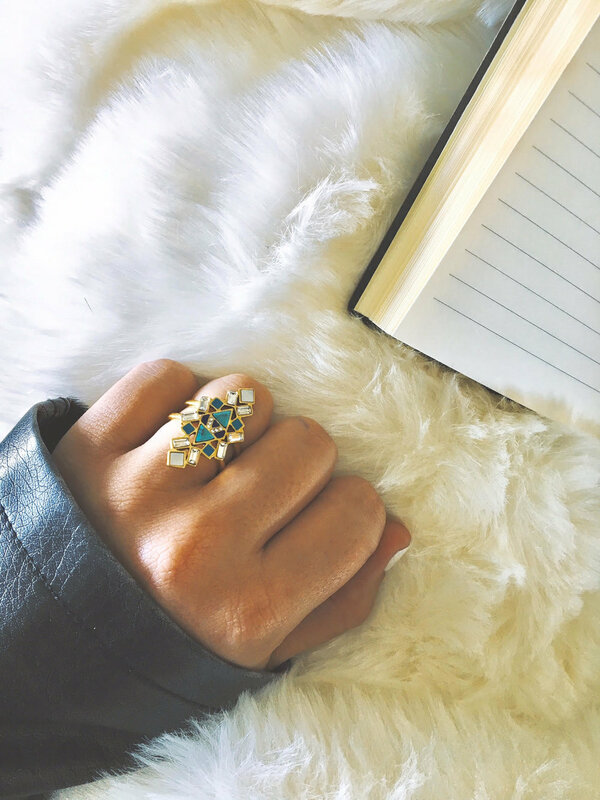 The Trove Statement Ring is stunning. Bursts of sparkle backed by semi shiny gold make this beauty. And I love that her design was inspired by the found treasures in the forgotten flea markets of Paris. It's truly the best piece to Go French Yourself with. I am obsessed with this ring. I have gotten so many compliments on it too. The 2nd addition is the Stone Tile Ring. This piece is on mega sale right now too. It features hand-set stones with semi-precious accents. And I adore the mosaic style. It has such a unique shape too . It reminds me of something I saw in Madrid so it brings back all these wonderful memories of New Mexico. I love that the band is adjustable too so I can rotate the finger I want to wear it on. The last beauty is Veda Split Ring. It's on mega sale too under $20. It's such a fun and flirty piece and I cannot get enough of it. It has just enough sparkle and I love the vintage looking gold fans and the gorgeous jade green stones. It reminds me of a treasure you would find in your great grandmother's drawer. There are still so many pieces I am coveting. There truly is something for everyone. 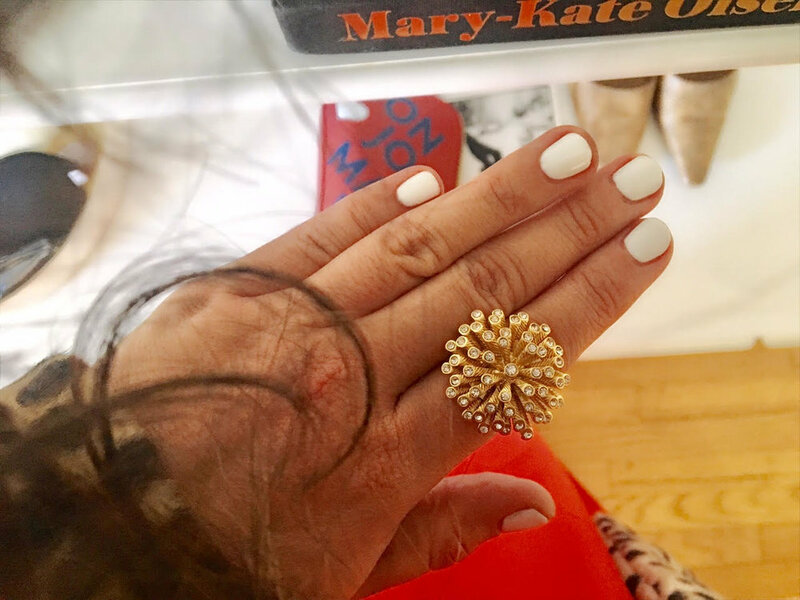 I am so curious to see what collections you love most and cannot wait to see the new gems you pick to move into your jewelry boxes. So excited to have partnered with Lisa. She is an amazing woman who is a wife, a mother, and a successful salon owner. She is out there making things happen for herself and it's so easy to be inspired by her. I have a trunk show starting today where you can shop exclusive offers with Stella & Dot. My show will go through February 25th too ! Everyone who purchases will be entered in my giveaway where you can win the fabulous Stone Tile Necklace. It's valued at $79 and is simply fantastic on. You must also follow Lisa here. And if the business side of Stella & Dot is something you would like more information on contact Lisa directly. She enjoys it because of the fabulous discount she gets on things she would already be purchasing. However many women are doing it for some extra funds added to their bottom line. I love companies that support women and provide amazing opportunities for them. Shop it now ! Be my Galentine!! It's SOLE good. Q & A With Karen and Jamie From Sole Massage.